The other night after P was in bed and Andrew was still at work, I nestled in with a little bowl of jelly beans (seemed like an appropriate snack), some craft supplies and my cricut. 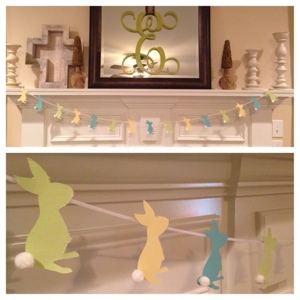 One one blog or another I saw a really cute bunny garland a few weeks ago and had been wanting to create something like it to spruce up the mantle for Easter. I find myself with lots of decorative eggs and Easter table accessories, but our mantle is pretty bare. Luckily I already had an animal cricut cartridge with a bunny shape. So all I needed was pastel card stock, some glue and little pom poms for fluffy bunny tails and ribbon. The whole thing is assembled with some sophisticated scotch tape on the back of each bunny's head.